Peter Max. Umbrella Man. Original. 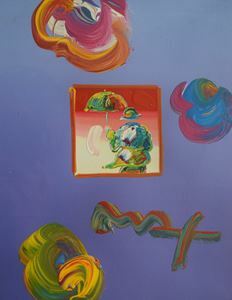 Peter Max original acrylic mixed media on paper. Approx. 8.5x11". Signed by artist. Framed. Certificate of Authenticity. Peter Max original acrylic mixed media on paper. Approx. 8.5x11". Signed by artist. Framed (25x29"). Certificate of Authenticity.